Dermatophytes are the fungi most commonly responsible for causing this condition. They are specialized organisms that live off of keratin, which is the main component of nails and skin. The most common types fungi that cause nail infection disease are Trichophyton rubrum and Trichophyton mentagrophytes. Everyone is at risk for infection because fungus is present everywhere in the environment. What are the Symptoms of Nail Infection or Nail Fungus? Current treatment options for nail infection include oral drugs, topical drugs and laser. No single treatment is 100% effective in all patients and there are risks and benefits associated with each one. Be sure to discuss all your treatment options with your doctor. effects including headache, diarrhea, upset stomach and skin rash. Serious side effects include risk of liver damage and heart failure. Weekly blood tests may be required to monitor liver function. These drugs are not used for patients in poor health or who have liver disease. months. In some patients, the drug is ineffective because it cannot pass through the nail to reach the infection. There are no significant side effects. The treatment involves passing the laser beam over the infected nails. Your physician will repeat this several times until enough energy has reached the nail bed. Your nail will feel warm during the treatment. A single treatment session takes approximately 10 to 15 minutes. Treatment times will vary, so please ask your doctor for more information. Most patients show improvement after one treatment. The required number of treatments will vary depending on how severely each digit is infected. Typically, the treatment is three to four sessions spaced one week apart. It all depends on the degree of fungal infection. Before the Procedure: It is important to remove all nail polish and decorations the day before the procedure. Also, please clip the nail as much as possible. During the Procedure: Most patients describe the procedure as being comfortable with a small hot pinch at the end that resolves quickly. After the Procedure: Immediately following the procedure your nail may feel warm for a few minutes. The majority of patients can resume normal activities immediately. As the nail grows you will see new, healthy nail. Nails grow slowly, so it may take up to 12 months to see an entirely clear nail. Is there any Clinical Studies Related to Laser Treatment of Toenail Fungus? 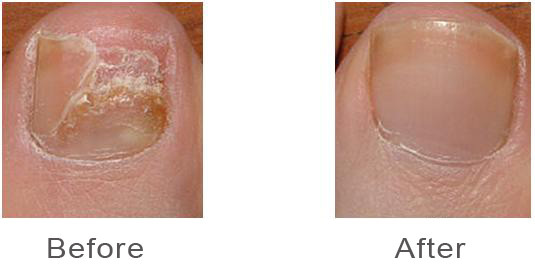 In a clinical study, 68% of patients treated for toenail fungus showed improvement in the percent of nail clear of infection. The amount of nail improvement you may experience is dependent on your individual circumstances and should be discussed with your doctor. Patients that did not have a successful laser treatment may be the result of poor hygiene / poor home care techniques. Your nail infection should improve following treatment but you will need to continue with home care techniques to reduce recurrence of the infection. There is a chance of re-infection because the fungus is present everywhere in the environment.